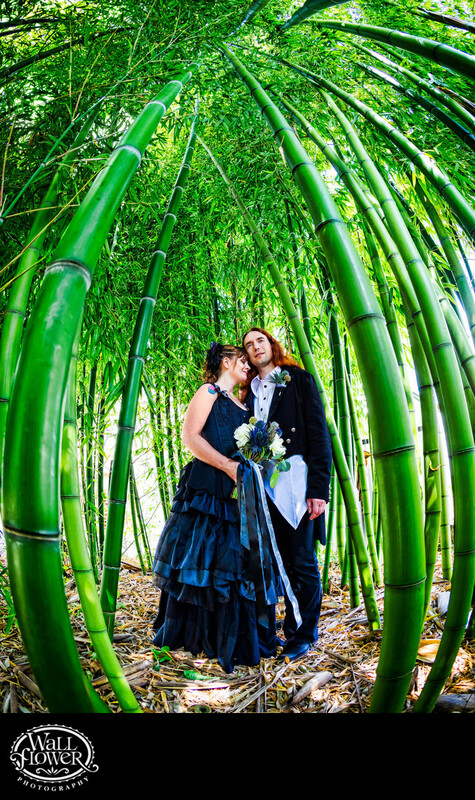 When this bride in a black wedding dress suggested that we go inside the bamboo grove at The Fields at Willie Green's in Monroe, Washington, I was all game. We found a little clearing in the center for the bride and groom to stand in, we had the bride nuzzle into her groom's neck a bit, and I shot this photo with a 15mm fisheye lens under nothing but the little bit of available light inside the bamboo. The fisheye lens captured an extremely wide-angle degree of field, which it accomplishes by bending the edges of the photo, curving the straight bamboo stalks as a frame around them.